Saudi prince, payload specialist astronaut 1985. First Arab in space. Status: Inactive; Active 1985-1985. Born: 1956-06-27. Spaceflights: 1 . Total time in space: 7.07 days. Birth Place: Riyadh. 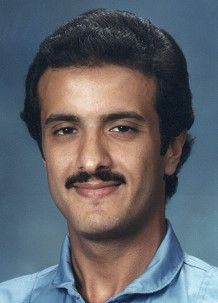 PERSONAL DATA: Born June 27, 1956, in Riyadh, Saudi Arabia. Married. Recreational interests include snow skiing, scuba diving, horseback riding, jogging, racketball, and swimming. EDUCATION: Completed his elementary and secondary education in Riyadh, Saudi Arabia. He later went on to study communications and aviation in the United States. EXPERIENCE: In 1982 he was appointed to the position of researcher in the Department of International Communications at the Ministry of Information in Saudi Arabia. In 1984 he served as Deputy Director for the Saudi Arabian Olympic Information Committee at the Olympics in Los Angeles, California. Later that year, when the Department of Advertising was created at the Ministry of Information, he was appointed its Acting Director. In 1985 he flew as a Payload Specialist on STS-51G Discovery (June 17-24, 1985). As one of a seven member international crew, which also included American and French astronauts, he represented the Arab Satellite Communications Organization (ARABSAT) in deploying their satellite, ARABSAT-1B. Upon conclusion of his space flight, he helped in founding the Association of Space Explorers, an international organization comprising all astronauts and cosmonauts who have been in space, and served on its Board of Directors for several years. In 1985 he was commissioned as an officer into the Royal Saudi Air Force. He holds the rank of Lieutenant Colonel, and is qualified in several military and civilian aircraft. For several years he headed the Advisory Committee for the Science Oasis Project to be built in Riyadh. In 1989 and then again in 1992 he was elected to the position of Chairman of the Saudi Benevolent Association for Handicapped Children; where he also served as the Chairman of the Board of Trustees for the Prince Salman Center for Handicapped Research. In 1991 he accepted an invitation from the Board of Directors of the Saudi Computer Society to become Honorary Chairman, and in 1993 due to his special interest in architecture he agreed to serve as Honorary President of the Al-Umran Saudi Association (a society of specialists in the fields of the built environment). Family: Astronaut. Country: Saudi Arabia. Flights: STS-51-G. Projects: STS. Bibliography: 12, 5103. 1956 June 27 - . Birth of Sultan Salman Abdel-aziz Al-Saud - . Nation: Saudi Arabia. Related Persons: Al-Saud. Saudi prince, payload specialist astronaut 1985. 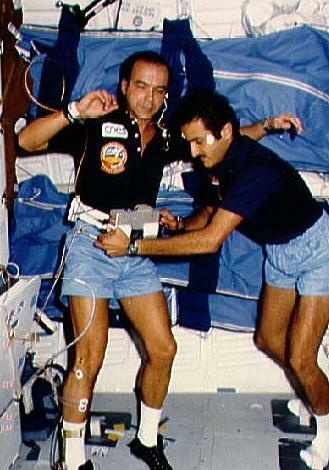 First Arab in space. 1 spaceflight, 7.1 days in space. Flew to orbit on STS-51G (1985)..